Our medium size oxygen cylinder filling plants have been designed for customers whose requirement falls under the capacity of 80 m3/hr to 170 m3/hr. Our company in technical collaboration with ING. 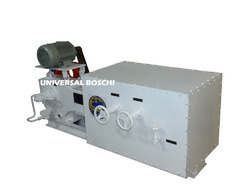 L. & A. Boschi of Italy designs, develops and manufactures the systems. The technology of the Italian company is approved since 1930. The columns of the machine are leak proof, stainless steel and skid mounted version for high purity medical and industrial oxygen and nitrogen. We use liquid oxygen pump, which is oil free & water free, for filling cylinders and bottles with high pressure. 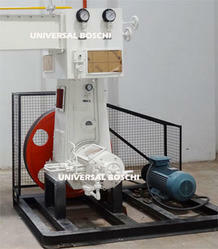 Universal Boschi 150 m3/hr. oxygen plants is designed to produce 600 cylinders in a day. Apart from the required area 14m X 15m, the system performs cylinder filling at 155 - 200 bar. The skid mounted version and pre packaged air separation unit makes the installation faster and hurdle free. The liquid oxygen pump fastens the system of cylinder filling manifold. 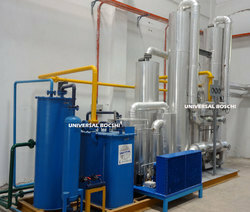 UB series oxygen plants are use for filling high pressure Oxygen/nitrogen gas in cylinders/bottles by liquid oxygen pump ( oil free water free) for industrial medical applications. Liquid Oxygen Pump passes from the condenser to the liquid oxygen pump for filling gas into cylinders. The cylinder filling is done through the integrated liquid oxygen pump (Connected to cold box) which is designed to fill oxygen gas into cylinders at high pressure of 155-200 bar. Air Separation Unit (100% leakproof stainless steel) consists of outer steel casing,main heat exchanger, liquifier, bottom column, top column, condenser, sub-cooler,liquid oxygen nitrogen filter. Cooling pipe line, insulation material, digital electronic temperature indicator scanner, pt 100 sensor, dp gauge monometer, expansion valve with long stem type with pointer index wheel. The high pressure oxygen gas upto 150 bar coming out of the cold box at 99.7% purity and bone dry (- 60 dew point) will be filled directly into oxygen cylinders in a oxygen cylinder filling manifold. Cryogenic Expander, hydraulically operated with variable cam for automatic control of pressure and temperature, this is also equipped with ball type valve at inlet and outlet which is proof for trouble free operation for years together complete with electric motor starter.